Price Matching is a wonderful way to save money at the register without having to do much work. What happens when you don’t know what Price Matching is or how to go about the right way to do it? Well I am starting a Price Matching series to help you with that! This first post in this series is: What is Price Matching? Price Matching is the ability to match a competitor’s price on a specific product that is lower than you find in the current store you are visiting. What are the benefits of Price Matching? Of course the most obvious benefit is to save money. By price matching you are getting a lower price for a specific product and thus paying less out of pocket. However, an added benefit is that you save time, gas, and your personal energy. By price matching at one store to another you do not have to drive to another store wasting gas and time to get that product for a lesser price. It’s a convenience worth taking advantage of. There are select stores that will price match competitor prices although more and more are joining this trend to keep your business. Each store has a specific set of rules of what they will and what they won’t price match. Generally as long as you have proof of the products price (printed ad, online pricing, picture of price in-store) they will usually price match it. Make sure that the price you are matching to is current and not an outdated price. Keep in mind that not all stores have to price match especially if the price seems to be too good to be true. 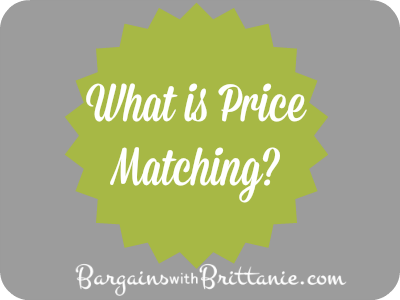 I will be talking more about how to price match at specific stores later in this series. Always have proof of the reduced price even if the store doesn’t require it. When starting out on Price Matching start small and work your way up. Don’t attempt large quantities of items your first time. Keep your eye out for more posts on this topic and don’t forget to pin it by using the button below.